LaPoma has written three novels, ten screenplays, and hundreds of songs and poems. His screenplays have won over 130 awards/honors at various international screenwriting competitions, and his black comedy script HARM FOR THE HOLIDAYS was optioned by Warren Zide along with Wexlfish Pictures (AMERICAN PIE, FINAL DESTINATION, THE BIG HIT) in July 2017. LaPoma's novel DEVELOPING MINDS: AN AMERICAN GHOST STORY is an Amazon Best Seller ("Satire" and "Urban Life" Kindle categories), and it won the 2015 Stargazer Literary Prizes (Visionary and Metaphysical Fiction category) and won the bronze medal in the 2016 Florida Authors and Publishers Association's President's Awards (Adult eBook category). His novel UNDERSTANDING THE ALACRAN is a finalist in the 2017 FAPA President's Awards (Contemporary/Literary category). He lives in San Diego and teaches at a public secondary school. What does it take to be clean again after years of drug abuse? For William James, it could mean getting as far away as possible from one’s immediate environment, steering away from friends, and starting a new life. That is why the twenty-two-year-old man leaves his teaching job at Buffalo high school and sets out on an odyssey to Mexico, hoping to find redemption. But this could have been the most unlikely place to go because the worst forms of temptation seem to await him in Mexico, with its drug business, bad company, hot bars, and a lot more. William finds himself plunging helplessly into the depths of the very thing he’s been trying to run away from. But things change in an encounter with a woman. 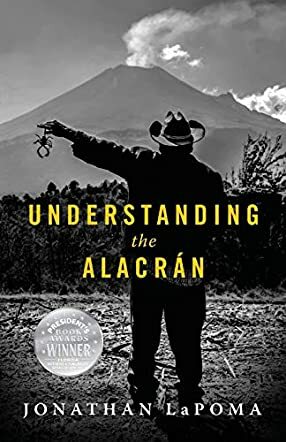 Understanding the Alacran by Jonathan LaPoma is a brilliant story that explores the evil of drugs, a man’s struggle for freedom, and redemption through love. In a very unique and accessible style, Jonathan LaPoma unveils the beauty of Mexico and crafts a setting that readers will fall in love with. The story is filled with breathtaking descriptions of scenes, places, and paragraphs that capture the Mexican culture with vivid clarity. The protagonist will speak powerfully to readers who suffer from an addiction. I could relate to him because I know the pain of being attached to an addiction and how hard it can be, struggling to get free from it. I enjoyed the author’s exploration of the power of love, something he puts above the sheer power of human will. Understanding the Alacran is a book that is very interesting. Well-crafted with a huge conflict that escalates and animates the fast-paced plot. The finish is awesome. In a beautifully written piece of literary fiction by author Jonathan LaPoma, Understanding the Alacran, readers will be treated to a book that will engage both their minds and their senses. Taking place amongst the raw beauty of Mexico, the story follows 22-year-old William James, a young man who has given up a great career opportunity in the hopes of escaping a real sense of oppression, oppression that once led him to crime, drugs and a dark despair. He finds the freedom he has wanted in the beaches and mountains of Mexico, and all is well until he starts to feel a dark desire to become involved in the drug trade that seems to envelop the place he lives. When he meets a complex and mesmerizing woman, he begins to wonder if love will bring him to the place he needs. Will it? You’ll need to read this excellent book to find out. I loved Understanding the Alacran. Loved. It. How’s that for a review? Well, it’s absolutely how I felt about this beautifully written, funny, moving and all-round wonderful coming of age story. Author Jonathan LaPoma has done an excellent job in creating characters that his readers will be able to connect with, relate to and truly come to care about. If that isn’t a hallmark of a great author, I’m not sure what is. Any reader who is looking for a fantastic work of fiction from a new author should absolutely read this book. I am pleased to be able to give this book my very highest recommendation, and look forward to reading more from the talented author, Jonathan LaPoma, as soon as I possibly can. Understanding the Alacran by Jonathan LaPoma is a fantastic story that introduces the reader to a lifestyle that involves drugs and crime, a compelling character seeking redemption from drugs and fighting to leave behind the “crutches” of his life. William James is just twenty-two when he decides he’s had enough and leaves his teaching job in a Buffalo high school, traveling to Mexico in the hope of making a change. But Mexico will not change him because the place has its own temptations and they are hard to resist. He soon finds out that his past catches up with him, that no matter how far he runs, he’ll still have to face himself. But before he hits rock bottom, something extraordinary happens: he meets a woman who changes everything! From the very beginning of the story, the reader gets swept away and pulled into the atmosphere in which the protagonist evolves. On the first page, describing a scene in Mexico, the narrator captures the general climate of the protagonist’s soul when he says: “The morning was peaceful, but I wasn’t.” The reader already gets a sense of what to expect from the start of the story. I enjoyed the protagonist’s journey, the passage from despair to hope, and above all, the search for inner freedom. Readers will also love the compelling characters and the way the author captures the Mexican culture, its beautiful setting with its smells and sounds in this inspiring tale. Overall, Jonathan LaPoma’s Understanding the Alacran is a wonderful coming-of-age story, and I was surprised at the allegory of the spider in the overall message of the story.